Today's the big coming out party for Windows Phone 7, with a gigantic Microsoft event starring Steve Ballmer. We're here live, and you can watch it live too. Update: It's official, Windows Phone 7 launches on November 8. Steve Ballmer keeps talking about how the point of Windows Phone 7 is that it's "always delightful" and "wonderfully mine." He sounds weird when he says delightful. There are nine Windows Phone 7 phones at launch, from Dell, HTC, Samsung and LG to start. We've got them all rounded up right here. And there's 60 carriers you'll be able to grab Windows Phone 7 on all around the world (except Verizon). AT&T Mobility CEO Ralph de la Vega is announcing the triplet coming to AT&T: the LG Quantum, Samsung Focus and HTC Surround. The Focus sounds like the winner of the group. It's the thinnest Windows Phone in the US, and it's got a 4-inch Super AMOLED screen. In other news, Steve Ballmer has an unfortunate predilection for TGI Friday's. Joe Belfiore wisely decides to skip it, showing us how Windows Phone 7 will help you decide whether or not you should go to Friday's. No, you really shouldn't. The web experience Belfiore's demoing is something Windows Phone 7 really gets right—note-syncing is built-in for free, and you can track down your lost phone using Microsoft's Live service. The IMDB application is holy crap nice lookin'. Games! Now this is what I'm really excited about. They look pretty good. EA's gonna have a "suite" of titles at launch, like the Sim 3. Copy and paste is coming in "early 2011." Wooo. 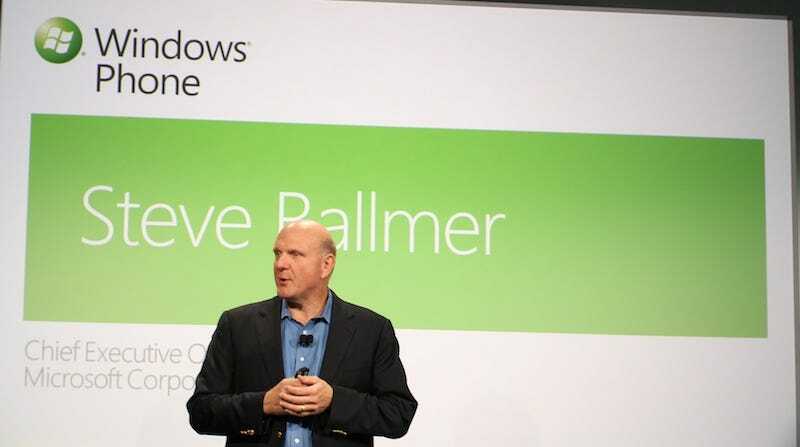 We're wrapping up, so I leave you with this picture of a mesmerized Steve Ballmer. It's the calmest I've ever seen him.